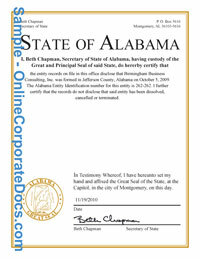 Alabama Good Standing Certificate | Online Corporate Docs, Inc. The Alabama Certificate of Existence (Also referred to as the Alabama Good Standing Certificate or Alabama Certificate of Status) is an official document issued by the Alabama Secretary of State. The State will issue a Certificate of Existence to any legal entity that is duly Incorporated/LLC or foreign qualified within the State and in good standing with the Alabama Secretary of State and is in compliance with all State required formalities. Upon application to the Alabama Secretary of State a Certificate of Existence will be granted to any domestic or foreign profit and nonprofit corporation, limited liability company that was duly formed or registered within the State of Alabama and is in good standing. The official Alabama existence certificate is a laser printed document that bears the printed watermark great seal of the Alabama Secretary of State and includes the business ID and a verification code that can verify the certificate at their website. A printable Adobe PDF of the document will me emailed to you next business day and the original will be mailed to you in 3-5 business days.